Most retirees didn’t notice the $5 cost-of-living increase in the average Social Security check. That’s because the Part B Medicare premium deducted from their checks went up nearly as much (from $104.90 in 2016 to an average $109 this year). Beyond premium hikes, the bigger issue for retirees are the additional out-of-pocket costs they must pay as part of their Part B coverage for doctor visits and outpatient care. 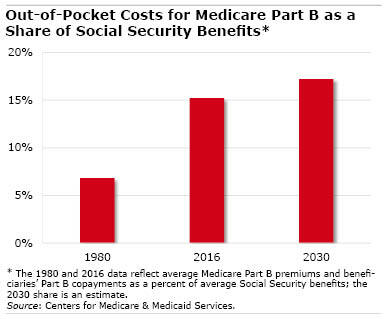 When rapidly rising copayments are added to the basic premium, they together consumed more than 15 percent of the average Social Security benefit last year. That is more than double the percentage in 1980, and it’s expected to exceed 17 percent by 2030, according to the Centers for Medicare and Medicaid (CMS). Some of the workers and retirees around the country who count on having a government pension surely get nervous when they see headlines about the most troubled state and local plans – in places like Illinois, New Jersey, Connecticut, Chicago, and Detroit. A broader perspective on retirement benefits, however, shows that the results are more mixed. A study by the Center for Retirement Research, which sponsors this blog, estimated long-term costs for pensions, retiree health benefits, and general debt service as a share of revenues for the 50 states, 178 counties, and 173 cities. Many states’ combined costs – pensions, other post-employment benefits (OPEBS) such as health insurance, and payments on all government bonds – appear manageable. More worrisome are the eight states with the highest combined costs: Illinois, New Jersey, Connecticut, Hawaii, Kentucky, Massachusetts, Rhode Island, and Delaware. 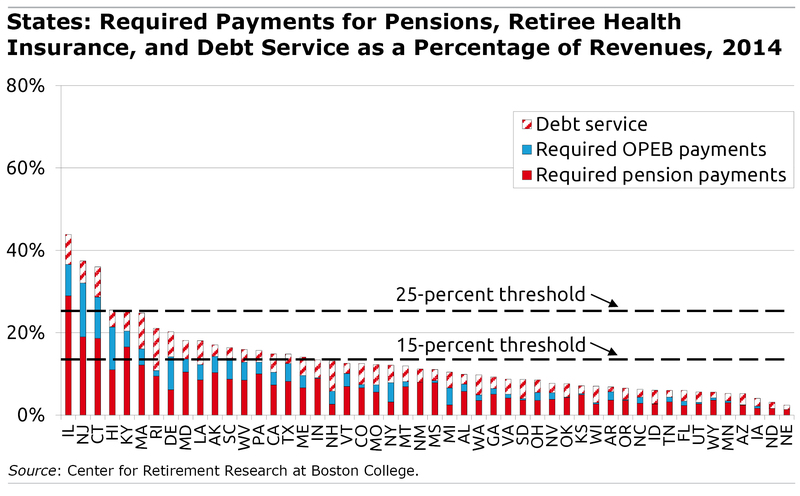 [States with high pension burdens also tend to have high costs for retiree health benefits]. Despite the normal cognitive challenges that people in their 70s and 80s inevitably face, most are sharp enough to be in charge of their financial affairs or oversee them. But the significant minority of seniors who do have trouble is explored in a new summary of the research by Anek Belbase and Geoffrey Sanzenbacher at the Center for Retirement Research, which supports this blog. One such group is people learning for the first time how to carry out financial tasks. Widows, not surprisingly, are often required to negotiate this financial learning curve, which gets steeper as a senior’s ability to process new information erodes. With guidance from a family member or professional, however, the novices can usually figure things out. Seniors with mild cognitive impairment might also develop problems. Mild impairment becomes fairly common by the time people reach their 70s, affecting their financial judgment and potentially their ability to manage their affairs in ways that promote their best interests. Among those with mild impairment, 82 percent can independently handle the various financial tasks they face, such as paying bills, managing bank accounts, and maintaining good credit. This compares with 95 percent of unimpaired seniors. It’s old news that the many baby boomers who did not get married and stay married are worse off financially than those who did. Unfortunately, the financial damage to one segment of this generation has broken new ground. Only 44 percent of “middle boomers” – those born in the late 1950s – have remained married to their original spouses, down from 52 percent of their parents’ generation. 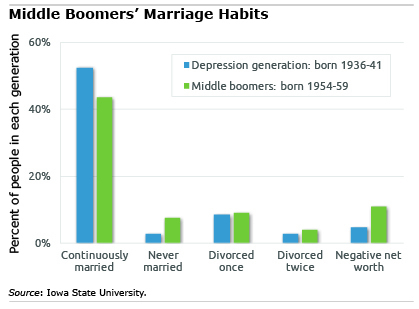 Middle boomers are also far more likely to have lived with partners without marrying, remained single all their lives, or even to have divorced twice. The heart of a study is determining which of middle boomers’ choices were most likely to have led to financial distress when they reached their pre-retirement years. About 11 percent of middle boomers had negative net worth by the time they were in their early 50s – more than double the share for the generation born during the Great Depression when they reached this age. Negative net worth means that middle boomers’ mortgages and other debts exceed the value of their assets; in this study, assets included everything from retirement plans and taxable bank accounts to primary and vacation homes. To understand why, the researchers culled marital histories from a survey of older Americans. They found that four lifestyles are most strongly linked to middle boomers’ negative net worth: never marrying, going through one divorce and becoming single again, separating from a second marriage, and divorcing from a second marriage. In all of these situations, the individuals were about three times more likely to have negative net worth than were the continually married middle boomers. The study controlled for age, gender, race, education, health, household income, and the number of offspring. Can Work Enhance Seniors’ Social Lives? Maintaining a network of family, friends, or even golfing buddies is critical to cognitive and physical health in old age, research has shown. What wasn’t known is how work affects the social lives of older people. Does work foster social ties or limit the time one has to socialize? A new study by Eleonora Patacchini at Cornell University and Gary Engelhardt at Syracuse University finds that those who continue to work have larger social networks. When between 45 percent and 60 percent of Americans don’t have enough money for retirement, encouraging saving is a national priority. A related issue is preserving the funds once they’re set aside. 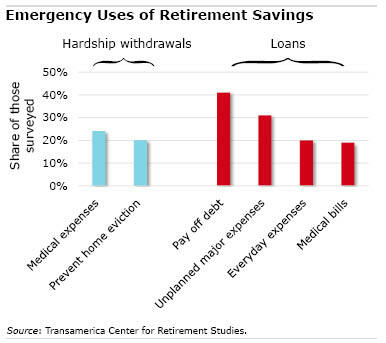 A survey released last month by Transamerica indicates that workers frequently resort to hardship withdrawals and loans from their 401(k)s, because they lack the cash required in emergencies. The survey bolsters the argument made by some retirement experts and employers that until workers’ cash-flow problems are addressed, many will continue to view retirement funds as their best option in an emergency. The number of Americans over age 60 who are paying back federal or private student loans has reached a critical mass, quadrupling to 2.8 million over the past decade, a new report finds. These older borrowers owe $23,500, on average, and two-thirds of them also have mortgages and credit card bills at a time their medical expenses are typically increasing, according to the report issued this month by the Consumer Financial Protection Bureau (CFPB). Separately, nearly 40 percent of those with federal loans have defaulted on their payments.